While Facebook may have scaled back its virtual reality activities, it doesn’t mean the general public isn’t getting a full dose of how the technology may look in the world of entertainment. The Oculus Story Studio of Facebook was recently closed, as the social media giant shifts its focus away from internal content creation to back more external production. Now one of the largest movie theater chains in the U.S. is creating a large base where consumers can easily try virtual reality for themselves. 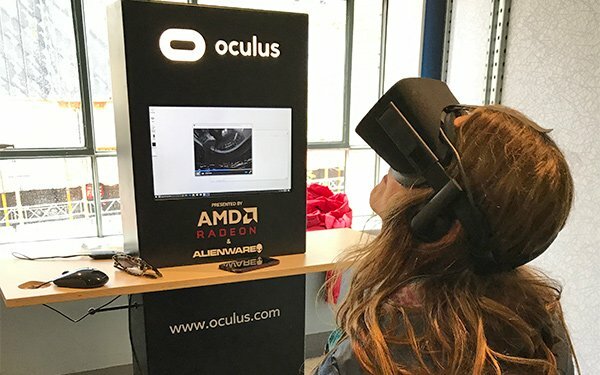 Regal Entertainment Group teamed with AMD, Alienware and Fox to provide a VR experience in 15 cities, inviting consumers to immerse themselves in an alien world, of sorts. I dropped by one of the demonstrations of the traveling event in the lobby of the Regal Fenway Stadium 13 theater in Boston to check it out. The theater lobby features several Oculus Rift demo kiosks where viewers wait in line to check out ‘Alien: Covenant In Utero,’ a 360-degree VR journey from the rather scary perspective of the alien. The VR demos are free and, at the least, introduce newcomers to a high-quality VR experience. For any Alien fans, it also can get the adrenalin going before diving into the movie. Regal Crown members get access to a priority fast-track line, which is highly advisable, since the VR kiosks are prominently displayed in the lobby and can easily draw a crowd. The interest in the virtual reality experience has been high, Clint Reese from 48 Communications, the company running the VR demos, told me. The VR video, with full audio, was produced and directed by Ridley Scott, the famed Alien franchise director. The remaining cities on the VR tour, which concludes June 1, are, in order, Knoxville, New York, San Francisco, Chicago, Philadelphia, Portland, Minneapolis, Washington DC and Seattle. The high production quality of the virtual reality movie can provide consumers a look at where VR is heading. It also may be a precursor of where movie theater experiences are heading. Innovations of various forms are on tap for the MediaPost IoT Marketing Forum May 18 in New York. Here’s the agenda.